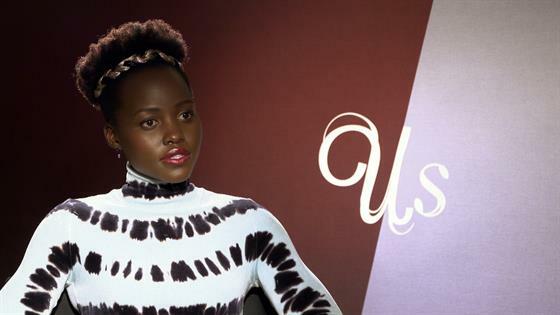 Lupita Nyong'o Talks Playing Two Characters in "Us"
In case you didn't know, Lupita Nyong'o and Rihanna are collaborating on a top secret project. Naturally, many are eager to hear all about it. Speaking to E! News, the Us actress lightly talks about the highly-anticipated collab with the Fenty Beauty founder. While the 36-year-old star doesn't reveal much in the interview, especially when she's asked point-blank what details she can share about the project, it's enough to fill fans up with excitement. "I can tell you absolutely nothing about that," she says with a playful smirk. Lupita most certainly acts coy with her answer, however, the bright side to all of this is that their project is really happening. As a little refresher, the two superstars signed on to work on a heist movie, which is the only clue fans have about their collab. And as nuts as it sounds, Twitter, of all places, is the reason they're joining forces. Fans quickly noticed how fierce and fabulous the 31-year-old beauty mogul and Us actress looked at the 2014 Miu Miu fashion show, which quickly became viral on Tumblr. In 2017, the charming photo resurfaced online and Twitter user Sixsxsix said what we were all thinking. "Rihanna looks like she scams rich white men and lupita is the computer smart best friend that helps plan the scans." Of course, Twitter went into a frenzy over the idea. In fact, the tweet went so viral that it caught the attention of Lupita and Rihanna. The 36-year-old actress wrote, "I'm down if you are @rihanna." To which RiRi responded, "I'm Pit'z." To fans' delight, the heist movie was announced in May 2017, starring the female powerhouses. Entertainment Weekly reported Netflix inked a deal for the concept at the Cannes Film Festival. Even better? Ava DuVernay is directing the film and Issa Rae is writing the script. While Rihanna is ruling the beauty and fashion world with her Savage x Fenty and Fenty Beauty lines, Lupita is dominating the big screen. The 36-year-old actress stars in Jordan Peele's psychological thriller, Us. "It was a dream of mine to work with [Peele] and I didn't expect it to come true so soon," Nyong'o says of working with the Get Out director. "When I started [working with him], I had to deal with the fact that I revered him and reverence kills creativity. So I had to get over that real quick." Adding, "I learned very quickly that Jordan is a team player, he's intelligent and his intelligence doesn't come from an egotistical place... He's interested in making the best work possible." "I loved working with him," she says with a smile. Watch the full interview with Lupita, above!